In the summer I crave Mexican food and in the winter I cannot get enough Thai food. Specifically, this winter. My co-workers and I have gotten into a bad habit of ordering thai food for lunch on cold, rainy and snowy days and I have gotten into the bad habit of ordering it for dinner on lazy evenings. I decided it was time to stop wasting money and stop eating food with mystery ingredients, so the other night I attempted homemade pad thai. In search for a recipe with the least amount of ingredients, I finally stumbled upon this version on sophistimom.com. I adapted it by swapping out the fish sauce for some Braggs Liquid Aminos (equivalent of soy sauce) and left out the shrimp/chicken/beef. I discovered that the key to that tangy pad thai flavor is tamarind, which I never knew. This dish tasted almost exactly like the dish I get at my local Thai restaurant and I can happily eat it, knowing exactly what is in it. Below is the recipe adapted from sophistimom.com. The one thing to note is that the brown rice pasta needed to cook much longer than the recipe states. 1. Set a large pot of water over high heat. While it comes to a boil, set a large nonstick skillet over medium heat. Add in oil, and gently cook the shallots until tender, about 3 minutes. Add in the chopped garlic and cook a minute more. With a slotted spoon, remove the shallots and garlic and place on a plate and set aside. If you want to add shrimp, chicken, or tofu, add it now and cook in the oil until shrimp is pink, the chicken is cooked through, or the tofu is nicely browned. Remove to the plate with the garlic and shallots. 2. When the water comes to a boil, slide the brown rice noodles* into the water and stir with a fork. When the water comes back to a boil, let the noodles cook for a minute, remove from heat, and cover for about 2 minutes. Strain and rinse with cool water. Set aside. *If you are using regular white rice stick (which these days is actually harder to find than the Tinkyada brown rice noodles), Let the rice stick soak in very hot tap water for 20 minutes, then drain. 3. Pour beaten egg into the hot skillet and swirl it around so the egg spreads out like a crepe. Reduce the heat to low and cover. Cook until egg is just done. Roll the egg up, put on the plate with the garlic and slice in strips. 4. Turn the heat up to high. Add the rice noodles to the skillet and pour over the tamarind sauce. Toss with a wooden spoon or silicone spatula. Add in peanuts, cilantro, and bean sprouts. Toss until most of the liquid is soaked in or evaporated. Add in reserved egg, shallots, and garlic. Toss well and pour onto a large plate. 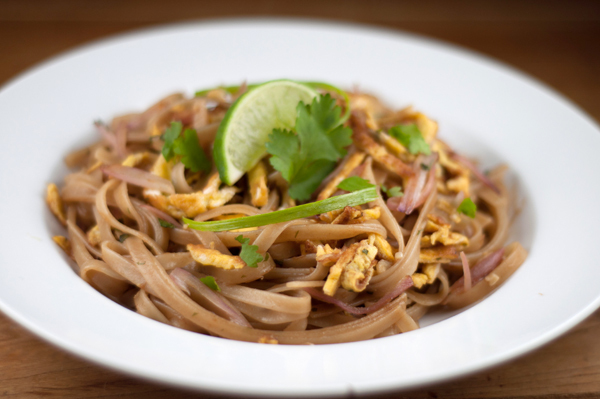 Garnish with more bean sprouts, cilantro, peanuts, and lime wedges. 1. (You can purchase concentrated tamarind sauce at most asian markets, which is what I dd. If you can’t find it, do the following): Soak tamarind in 1/2 cup of boiling water for about 5 minutes. Break up fibers and seeds with a fork, and press through a sieve set over another bowl or glass cup measure. Be sure to scrape all the pulp from the bottom of the sieve. 2. Add in the rest of the ingredients, and stir with a fork. This entry was posted in Recipes and tagged Agave, brown rice noodles, cilantro, eggs, extra virgin olive oil, garlic, lime, liquid aminos, peanuts, rice wine vinegar, scallions, shallot, tamarind. Dare I say that this beats Thai Cafe? Yeah, S&p, let’s see some PSE(?) I’m into it.